Mix together first five ingredients. Place dehydrated potato slices in casserole dish. Sprinkle dry ingredient mixture over potatoes, add boiling water and butter. Stir until butter is melted and sauce is smooth. Stir in milk. Bake at 400°F for 30-35 minutes until potatoes are tender. 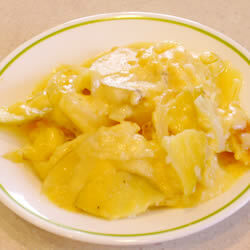 USING FRESH POTATOES: Peel and slice 3 medium potatoes and place in casserole dish. Heat milk and butter until warm then add dry ingredients; mix until smooth. Pour over potatoes. Bake at 400°F for 45-60 minutes until potatoes are tender.